(John Carlo) Just after the Deluge, at the dawn of the present time cycle, an era the Egyptians called ZEP TEPI, "The First Times", a mysterious group of "gods" appeared, to initiate the survivors in the rudiments of civilisation. From Thoth and Osiris in Egypt, to Quetzacoatal and Viracocha in the Americas, traditions worldwide subscribe the origins of contemporary civilisation to this sophisticated group. Despite the misleading popularity of Von Danikan journalism, evidence from around the world, indicates these people were the hi-tech survivors of the previous civilisation. Like the nuclear survival bunkers and secret research facilities of our civilisation, there were those who arose from the underground "cities of the Gods", after the dust settled. They were the "prediluvian patriarchs", like Enoch and Methuselah, the "giants and heroes of old", mentioned in Genesis. The enigmatic gods ancient Summer, Egypt and India, all hail from the fabulous times before the Flood. Since the declassification of the new ground-penetrating radar 2 years ago, the most staggering data has emerged of complex and labyrinthine underground systems in various parts of the world. At places like Guatemala in the South Americas, tunnels have been mapped under the Mayan pyramid complex at Tikal, which extend a full 800 kilometres to the opposite side of the country. Investigators remarked, it was possible to understand how half a million Mayan Indians escaped the decimation of their culture. In similar fashion, the SIRA radar was deployed in Egypt as early as 1978, mapping an extraordinary subterranean complex beneath the Egyptian pyramids. Arrangements made with President Sadat of Egypt, resulted in three decades of top secret excavations to penetrate the system. At a recent meeting in Australia, one of the key scientists on the Giza project, Dr. Jim Hurtak, showed film footage of work in progress called, CHAMBERS OF THE DEEP, due to be released at the end of the century. The film reveals the discovery of a vast megalithic metropolis, 15,000 years old, reaching several levels below the Giza plateau. While the rest of the Nu-Age speculates about a hidden chamber under the left paw of the Sphinx, the legendary "City Of The Gods", lays sprawled beneath. Complete with hydraulic underground waterways, the film shows massive chambers, the proportions of our largest cathedrals, with enormous statues, the size of the Valley of the Nile, carved in-situ. Researchers, risking their lives with lights and cameras, carefully negotiated rubber dinghies across subterranean rivers and kilometer-wide lakes, to penetrate sealed chambers beyond. Already, remarkable caches of records and artifacts have been found. It is the legacy of a civilisation and a technology way beyond our own. A technology capable of creating a vast underground city, of which the sphinx and pyramids are merely the surface markers. The project scientist, Dr. Hurtak, likens it to the impact of contact with an advanced extraterrestrial culture. He described it as the discovery of the Fourth Root culture, the so-called Atlantean civilisation, destroyed by the last earth tumble. It presents unequivocal evidence that all languages, cultures and religions trace back to a single common source, which Dr. Hurtak refers to as the "Parent Civilisation". The technology unearthed is way beyond machine technology, as we know it. As Arthur C. Clark once joked, "any technology beyond our own would seem like magic to us." According to Dr. Hurtak, this was a culture who cracked the genetic code and possessed the keys of the physical spectrum, the "Higher Light Physics" of the ancients... everything old Gilgamesh went searching for in his famous trek to the lost "City of the Gods" to search the tunnels beneath "Mt. Mashu" in the desert lands. 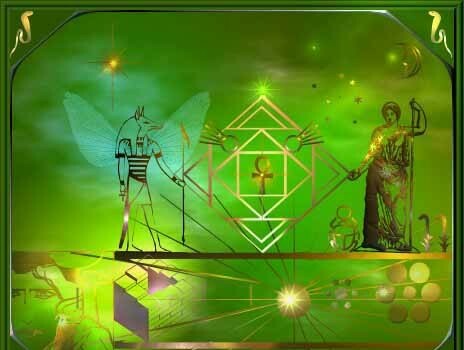 Hurtak refers to a "language of light" and a great priest-scientist of the previous time cycle, named ENOCH, who is associated with the building of the Great Pyramid complex. Hurtak alludes to a grand spiritual science, a science which describes a genetic stairway to the stars. The priest-scientist ENOCH, is a prediluvian patriarch, one of the most famous and seminal characters of the previous time cycle. Father of Methuselah and great grandfather of Noah, Enoch is credited in the Bible as architect of the original Zion, the legendary "City of Yahweh", as well as inventor of the alphabet and calendar. Enoch is also history's first astronaut, who "is taken aloft by the Lord" and shown "the secrets of earth and heaven". He returns to earth with the "weights and measures" for all humankind. Known to the Egyptians as THOTH, the "Lord of Magic and Time" and to the Greeks as HERMES, "messenger of the gods", he is even remembered in the Celtic tradition as the enigmatic wizard Merlin, who disappears up an apple tree to mythic Avalon, seeking the secret of immortality and vowing to return. As one who attained immortality, the secret of how we "might become as gods", Thoth/Enoch promises to return at the end of time "with the keys to the gates of the sacred land." In the controversial Dead Sea Scrolls, revealing the lost Books Of Enoch removed from the Bible by early religious leaders, Enoch describes a wondrous civilisation in the past, who misused the keys of higher knowledge and were unable to save themselves from the last cataclysm. Both literally and figuratively they lost the "keys", they lost all higher knowledge.Yet, Enoch, along with many traditions, even the Mayan legend of Quetzacoatal, promises a return of this knowledge at "The end of time", the end of the present time cycle. Related The Bible tells you not to take it literally!!! Biblical Revelations promise "all will be revealed" at the end of the present world. The extraordinary discoveries in Egypt and other parts of the world, describe not just an advanced technology but, evolutionary path beyond our present state. Careful scientific examination of the world's key pyramid sites, reveal them to be sophisticated harmonic structures, not only mirroring positions of the planets and stellar systems but, designed to mimic the chakras and harmonic cavities of the human body. Even each stone within the Great Pyramid is harmonically tuned to a specific frequency or musical tone. The sarcophagus in the centre of the Great Pyramid is tuned to the frequency of the human heart beat. Astonishing experiments, conducted by Dr. Hurtak and colleagues at the Great Pyramid and other sites in the South Americas, demonstrate the pyramids to be voice-activated "geophysical computers." The "keys" Enoch speaks of, turn out to be sound keys, keys to be vibratory matrix of reality itself, the mythic "Power of the World". The Enochian knowledge describes sonic equations, encoded within the ancient mantras and god names, capable of directly affects the nervous system and producing profound effect of healing and higher consciousness states. As the ancient texts declare, "If you would speak with the gods you must first learn the language of the gods." DNA, the ancient cabalistic "Tree Of Life" portrayed in the Biblical Torah, is now coming to be viewed as a live vibrating structure, rather than a fixed tape recording. Many modern scientists, regard DNA as a shimmering, waveform configuration, able to be modified by light, radiation, magnetic fields or sonic pulses. The legacy of Thoth/Enoch suggests this "language of Light", the harmonic science of the ancients, could actually affect DNA. The evidence in Egypt, indicates this was the grand 6,000 year genetic experiment attempted by the Egyptians, the quest for immortality and the stars, a quest described by the great ones of old, a quest initiated by Gilgamesh so very long ago. The Egyptians were not fixated on the afterlife, as thought by early Christian translators but, focussed on creating a higher type of human. Along with many ancient cultures, they believed DNA came from the stars and was destined to return.The knowledge of Thoth/Enoch implies humans are meant to evolve beyond our present terrestrial form, as the Bible tells us, "we may become greater than angels".The Egyptians record stories of the "Star Walkers", occasional individuals who, like Enoch, travelled "beyond the Great Eye of Orion" and returned, to walk like gods amongst men. Despite the bleaching of semi-divine beings from modern consciousness, could it be possible, as the ancient texts insist, we are destined to "become as gods"? are the Mayan "Lords of Light" and the Egyptian/Tibetan "Shining Ones" really a higher form of human? According to many earth legends, such beings are supposed to return regularly, at the beginning and end of each time cycle, the 13,000 year half-point of our solar system's 26,000 year zodiacal orbit around galaxy centre. Because of conditions on our galactic orbit, these 13,000 year intervals or "worlds", seem to be separated by cataclysmic upheaval. According to the "calendar in stone" of the Great Pyramid, which describes the so-called "Phoenix Cycle" of our galactic orbit, the present time period ends (converted to our present calendar) in the year 2012 AD. The Greek word PHOENIX, derived from the Egyptian word, PA-HANOK, actually means, "The House of Enoch". The Enochian knowledge suggests, these regular cataclysmic changes act as an evolutionary agent provocateur, to quicken the resident life forms to the next evolutionary phase, prior to exodus from the womb planet. Human evolution may proceed more rapidly than previously thought. The evidence now appearing, records civilisations before us, who mastered the physical continuum and progressed beyond this world. There were also those who failed. We, too, have equal opportunity to make it or break it.The discoveries emerging from Egypt, describe the existence of a world wide pyramid temple system in prehistory, mounted like antennae on the key energy meridians, which were employed by ancient priest-scientists as a musical system to stabilize the tectonic plates of the planet... cataclysmic geology at it's finest. From the mother tongue word JEDAIAH, meaning "the way of the Word" or "the power of the Word", the ancient JEDAI priests used the language of Light to tune the planet like a giant harmonic bell. Much is being rediscovered in the last days of this time cycle. In the words of Dr. Jay Franz, of the Omega Foundation, "even if we don't dare to name it, there is a universal feeling of something impending on the world stage."